Last weekend’s World’s Greatest Restaurant Festival – Taste of Sydney may have battled with the weather gods, but! that didn’t keep the Chill crew away. This was our sixth year in attendance and the event never disappoints. Taste of Sydney is definitely one of the best festivals of the year on our calendar that puts your senses & taste buds in overdrive. Amazing food, groovy music, cocktails & mock tails, and the most important factor to a well-organized event, brilliant atmosphere. One of the highlights [in our view] had to be the Garden Bar. Designed in a rustic and quirky style using recycled pallets, similar to our very own Head Office in Sydney. We love and support the initiative of using recycling wooden pallets for furniture, but also the decor. Not just because we think it’s cool, because let’s face it, sustainability is almost a must these days & on everyone’s agenda. If you dig furniture pieces like this, you only have to google pallet ideas & over 1000 inspirational ideas are at your fingertips. Perhaps, your home or office is due for an update, you may even be looking for a creative idea for an exhibition stand; here’s a link with some cool ideas to get you started. 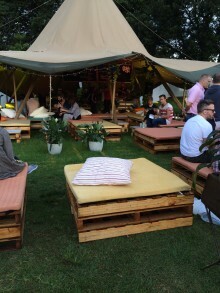 http://www.designrulz.com/product-design/2012/09/35-creative-ways-to-recycle-wooden-pallets/ Chill out and have fun!!!! This entry was posted in Chill, Chill Team, Community News, Sustainability. Bookmark the permalink.